The images have been seared into the global collective memory, of Russia's vitality being threatened with suffocation in the smoke of the summer fires. Mother Russia was gagging on the sins of the past, because it had immoderately plundered the forest, the ores and all the other raw materials - and is still doing so with the natural gas. An "indolent giant", quipped the Frankfurter Allgemeine Zeitung, suggesting the country was notoriously indifferent to pain. Against this backdrop of truth and prejudice, not to mention the helplessness of the international audience, the Russian Pavilion at this year's Architecture Biennial in Venice gets eight out of an imaginary ten on my personal score sheet. The jury members awarding the Golden Lion sadly ignored the Russians, a drop of bitter vermouth in the glass of the empire of vodka. If one were mean, then one could talk down the perfect package of exhibition, catalog and film as aggressive and brash advertising by Russian project developers. Yet exactly that is what the goal must be: Something simply has to be done given the dilapidation and pending loss of these mediocre cities in "Nowhere Land", alternatives must be developed, something that can only be done on the back of a profound understanding of the past. 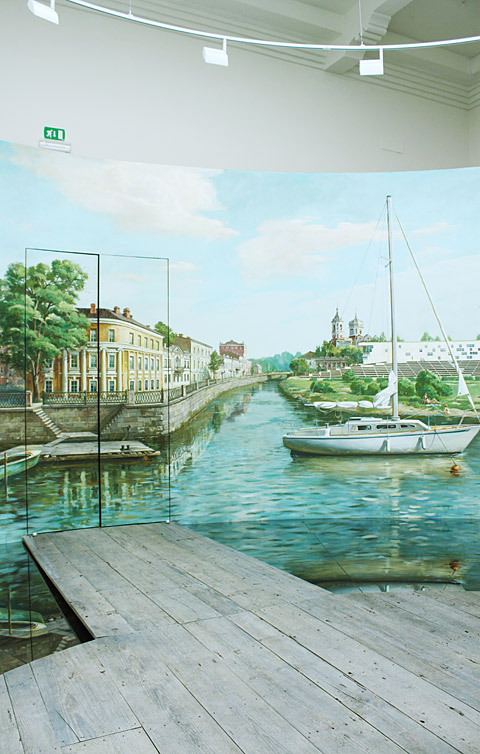 Why this long approach to our destination Vyshny Volochok 2.0 in the marvelously restored Russian Pavilion in the Giardini and the Biennial as the current host to the world's most important architectural statements? 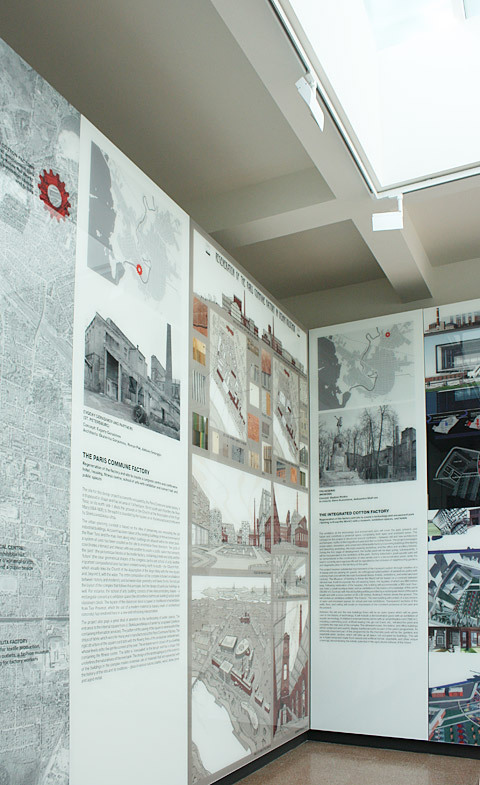 Together with his colleagues Grigory Revzin and Pavel Khoroshilov, Russo-German architect Sergei Tchoban (architecture offices in Berlin, Hamburg, Moscow and St. Petersburg, where he was born in 1962) curated this year's exhibition, which is entitled "Factory Russia - Transformations for Vishny Volochok". Tschoban over-taxes and stimulates the visitors' minds with a an ambivalence similar to his own - he himself lives in two countries. And he makes use of extreme emotional states in the process. That starts right at the bottom of things and can only be justified by the fact that as an architect and planner in Russia you always teeter on the edge of a precipice and sometimes go crashing. 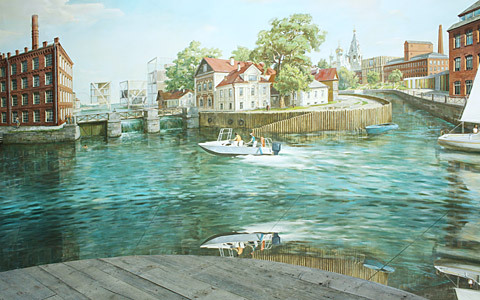 Thus, the route round the show starts for Western visitors with a "sentimental journey", and for Russian viewers with a decidedly not pain-free memory of the socialist halls and factories of former great eras. This, the first of the three emotional worlds, is entitled Time Over. What you see is a melancholic, morbid movie marked by a large clock that ticks away as the old properties fall into nothingness. The pavilion designed by Aleksey Shchusev in 1913 was completely restored in 2010 by architect Clemente di Thiene. In the entrance zone this has led to the interior being stripped back to the rough brick walls. The house was thus transformed into a construction ruin - and its walls into a mirror showing an emaciated factory. Curator Tschoban offers us no respite, either as regards a personal tour or a concept. He leads visitors up a few stairs, through a small door and into the light. 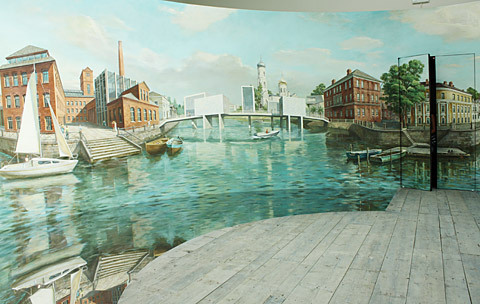 And in the form of a 360° panorama he presents us with Paradise, the interior of a lighthouse for the burgeoning urbanism of Russia. Now, you could call this construction kitsch and Disneyland and consider it outrageous that the brash seductive world of an intact city be presented here. In the West this would be arrogant. Because the so explicitly staged gap between yesterday and today unleashes so much energy and is something that the former textile and glass-making city of Vydhny Volochok halfway along the high-speed track from Moscow to St. Petersburg really needs, because it has shrunk from a population of 100,000 in its heyday to half that number today. 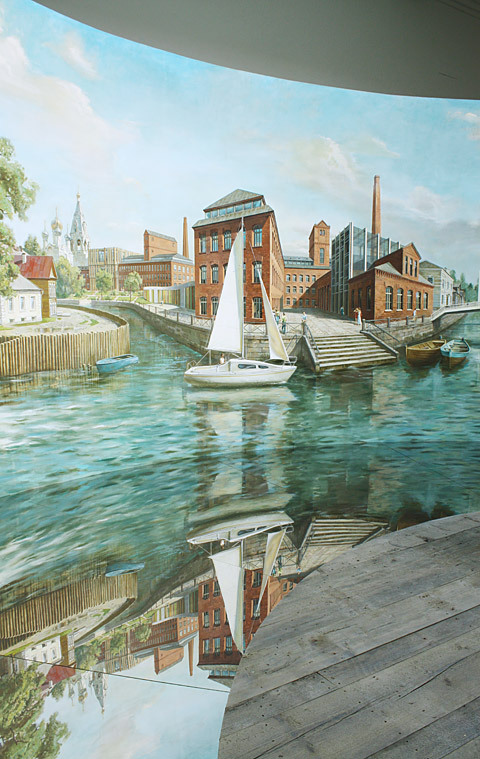 The city was first founded around the 15th century, on the watershed between the Volga and the Baltic, and was strategically expanded under Peter the Great - who had a canal connecting two rivers built. The name essentially refers to the "upper customs station". The glorious rise in the days of the Czars and Soviets was followed by the deep fall in the post-socialist world, with the location having since mutated almost into a city of the dead, forcing inhabitants to flee in search of work. That said, the plan is to transform the city of the long-distance commuters into the open city of tomorrow by converting its historical industrial setting. That is the message: To salvage the architectural heritage here by turning it into the residential and educational edifices, the trade and commercial properties that are so sorely needed - and to back this up with cultural facilities such as museums. Now that fits the bill in Venice this year. The 12th Architecture Biennial seeks to be a place of introspection and change, and that it can be. General Commissioner Kazuyo Sejima from Japan has called for a return to the architectural as the big picture, and in the two parts of her central "People meet in Architecture" exhibition put this so consistently into practice with a woman's weapons (i.e., the diplomacy that actually tolerates no contradiction) that non-members of the architectural community consider it art. One of the key messages of the national pavilions would seem to be that the respective region is getting going - albeit while also reflecting on its past. Israel, for example, has returned to its old but successful kibbutz idea. For us Germans a look backwards is not something amazingly new; for the last 20 years a lot of elbow grease has gone into thinking in particular about the Ruhr region and the decrepit industrial landscapes of hat was once communist east Germany. And now this is happening in Russia, too. At long last, one might add. 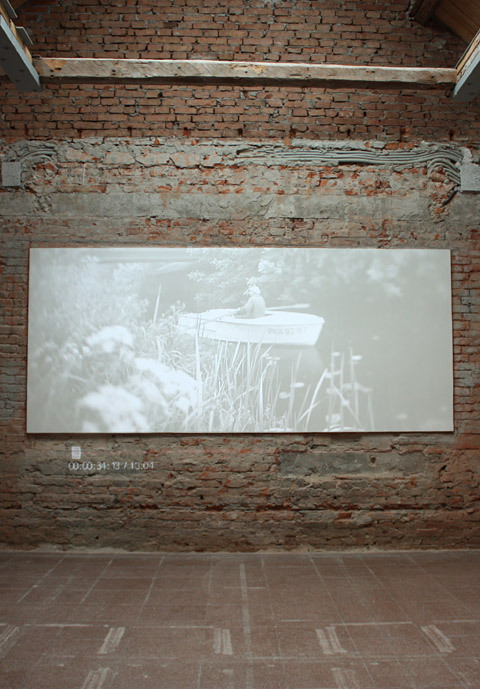 Vyshny Volochok, or so the wish of the curators, should become the prototype for about 300 similar patients in need of care - which is why the case history has been prepared for Venice, instead of the usual architecture presentations. However, here, too, architects and planners present their ideas for five revitalization projects. Two of them come from Moscow: Vladimir Plotkin and Sergey Skuratov, two from St. Petersburg: Evgeny Gerasimov and Nikita Yaveyn - and the latter two from SPEECH Tchoban/Kuznetsov, have an office in both cities. The focus is on four erstwhile factories - and the historical downtown. And in a third room, after the rotunda, the architects show the basis for their designs and prove with modern architecture that nevertheless always cites Russian moments from 20th-century architecture, what can be done if one wishes the city to rise lie a phoenix from the ashes. 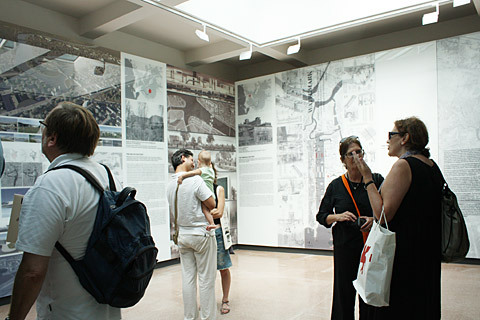 Essentially, this room with the precise architectural drawings forms the most rational of the three emotional worlds. Sergei Tschoban comments on the trio that it could just as compellingly have been derived from the old pavilion itself, showing how timeless most of these old structures in the Giardini are if you care for them. 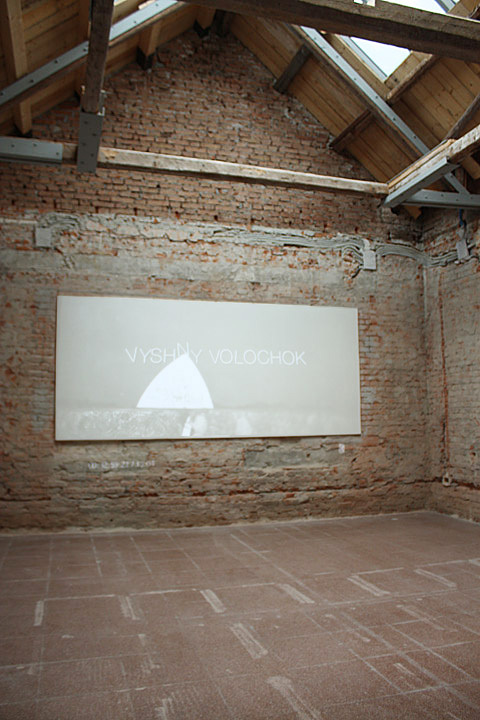 And thus the exhibition concept itself becomes a good parable on the city patient that in this case goes by the name of Vyshny Volochok.